WASHINGTON (CNS) — Sister Mary George O’Reilly, alumna and former president of Rosemont College in Pennsylvania, always wanted to help her school, even in hospice. She even offered to make phone calls. Sister Mary George, a member of the Society of the Holy Child Jesus, died of heart failure March 10 at the age of 95, the Philadelphia Inquirer reported, but friends say her dedication to Rosemont and its people is a legacy that will last forever. “Rosemont was the mission of her life,” said friend and former president Margaret Healy. Born Agnes O’Reilly, her first experience with Rosemont College was in 1934 when she started pursuing a bachelor’s degree in chemistry. In the following several years, she would tackle nearly every leading position the school had to offer her. Sister Mary George made such an impact at Rosemont that former students called her a “tradition,” the Inquirer obituary said. She became president of Rosemont College in 1962 and continued her term until 1971. Eleven years later, she returned to the school, by request of then-President Dorothy Brown, and raised $8.3 million by 1992 for the school’s capital campaign. From 1996 to 2003, she worked as executive assistant to the college president. “She knew the college very well, and she had connections all over the place. She valued the relationships,” colleague Sister Helen McDonald, of the Society of the Holy Child Jesus, said in the obituary. Healy said she would not only know alumnae of the school but also their husbands’ names and what their children were doing. She was always interested in people’s lives and praying for their causes. Healy said students really began to know Sister Mary George after they left college. They would send her Christmas cards or wedding announcements, and she would always write back. 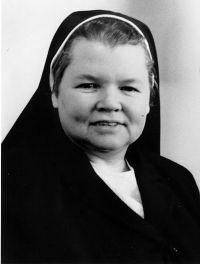 Even after she retired, Sister Mary George would attend various school functions and provide a familiar face to alumnae. “They thought the college was in good hands when she was around,” Healy said. Though Sister Mary George retired from the school in 2003, she never stopped wanting to help and educate people. That same year, she started volunteering with Thresholds, a nonprofit organization that helps inmates with decision-making in Delaware County, Pa.
She specifically enjoyed working with young men in their twenties who had been gang members. Sister Mary George would counsel any man officials referred to her, Cook said, regardless of what he was like. To Healy, this wasn’t a surprise. She wasn’t the type to scold people’s choices or actions. Sister Mary George’s volunteer privileges were nearly derailed in 2007 when the state of Pennsylvania wouldn’t renew her driver’s license, but she eventually persuaded other volunteers to transport her to the prisons. Healy confirmed that Sister Mary George “wasn’t a very good driver,” saying she often drove fast and made comments to the other cars. But no longer having valid driver’s license didn’t stop Sister Mary George from visiting the school either. Hirsh said in one case, Sister Mary George, at almost 90 years old, was determined to attend a certain school function and walked to Rosemont by herself, crossing a very busy avenue in the process. The person Rosemont designated to drive her wouldn’t be there quick enough, Sister Mary George thought. Sister Mary George continued volunteering with the prison until 2010, age 91. Around this time, she was living at the Holy Child Care Center and had experienced various injuries. Healy, as well as Hirsh and former President Dorothy Brown, kept in contact with Sister Mary George for the rest of her life. Healy visited her on the Friday before she died, saying she was “wide awake and talking, talking, talking.” Sister Mary George died three days later. Back in 2004 at Sister Mary George’s 85th birthday celebration, Brown gave a speech thanking her dedication to the school. Brown faxed a transcript of her speech to CNS. Near the end was a passage she thought summarized Sister Mary George’s devotion to Rosemont. It was an excerpt from a letter Sister Mary George sent to Brown in April 1979. In honor of Sister Mary George’s service to the school, Rosemont plans to hold a memorial Mass May 3, what would have been her 96th birthday. A public wake for Sister Mary George was held March 14 at the New Sharon Chapel in Rosemont, Pa., with a viewing and celebration of her funeral Mass there the following day. Interment was in Calvary Cemetery.